This trail, popularly known as Via dell'Amore, is an entirely cobbled pathway perched over the sea that connects Riomaggiore to Manarola in short time, offering remarkable views. It was hewn out of the cliffs in the years 1926-1928 making use of the mining benches made by the quarrymen working on the Genoa-La Spezia railway at the end of 19th century. The short stretch over Batternara runs just above the railway tunnel. 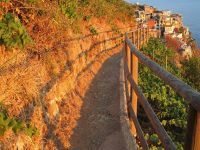 It starts and ends nearby the railway stations of Riomaggiore and Manarola, where there are two Park's tourist reception and information points.